For you Catholics...All the feel-good aside of comforting a little boy, how do you respond to this theology? In earnest, I am not trying to pick a fight here. I am genuinely curious. "If only we could all cry like Emanuele when we have an ache in our hearts like he has," the pope told the children. "He was crying for his father and had the courage to do it in front of us because in his heart there is love for his father." 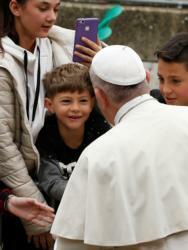 Pope Francis said he had asked Emanuele if he could share the boy's question and the boy agreed. "'A little while ago my father passed away. He was a nonbeliever, but he had all four of his children baptized. He was a good man. Is dad in heaven?'" "How beautiful to hear a son say of his father, 'He was good,'" the pope told the children. "And what a beautiful witness of a son who inherited the strength of his father, who had the courage to cry in front of all of us. If that man was able to make his children like that, then it's true, he was a good man. He was a good man. "That man did not have the gift of faith, he wasn't a believer, but he had his children baptized. He had a good heart," Pope Francis said. "God is the one who says who goes to heaven," the pope explained. The next step in answering Emanuele's question, he said, would be to think about what God is like and, especially, what kind of heart God has. "What do you think? A father's heart. God has a dad's heart. And with a dad who was not a believer, but who baptized his children and gave them that bravura, do you think God would be able to leave him far from himself?" "Does God abandon his children?" the pope asked. "Does God abandon his children when they are good?" "There, Emanuele, that is the answer," the pope told the boy. "God surely was proud of your father, because it is easier as a believer to baptize your children than to baptize them when you are not a believer. Surely this pleased God very much." Pope Francis encouraged Emanuele to "talk to your dad; pray to your dad." Though it's hard and generally unfair to dissect the theology of impromptu pastoral remarks, I would say that, though the Pope's theological synthesis probably falls on the more liberal end of the spectrum, it still falls within Catholic orthodoxy. Catholics do not believe that there is any great or magical work that one can do to merit eternity with God. Nor do we believe that there is any sin that cannot be forgiven— other than final impenitence. This much I would agree with. Jesus did that for us. I find this interesting in that I just finished reading CS Lewis's A Grief Observed and couldn't help wondering if this little boy's dad would head for the mountains, or go back to the bus. Pope Francis thinks he'd head for the mountains and I agree---but only God knows. Since the Pope can't know what God can or can't or will or won't do, he chose to give a compassionate answer. Isn't it more important to minister to the living rather than the dead? I like his answer whether it is doctrinally sound or not. If I'm not mistaken, the Catholic faith believes even unbelievers can be purified in purgatory, right? But what I mean is that we do not have a simple answer to "Have you been saved?" There's no magic moment or saying of a Sinner's Prayer that guarantees our ticket is punched for entrance into Heaven. We know that every soul in heaven is a "saint." And we also know that a great many people die who are not yet saints.... but they aren't hardened sinners, either. So we always carry hope for those souls who are "barely saved".... and we pray for their purification with the hope that they will someday be ready to enter heaven. We pray hard for this. So it makes sense to us that a pastor such at Pope Francis would encourage hope in a boy who has lost his father. Even if the father was not a "believer," he seems to have been a good man with enough faith to see his children baptized. This gives us reason to hope that the father met Jesus as his personal judgment -- and accepted Jesus's invitation to embrace Him. Even if it means a long purification, every soul in Purgatory will enter into the presence of God. so we hope and we pray. We have no cause to insist that this "unbelieving" father is not on his way to Heaven. I visited an Evangelical Free Church once, invited by a young family who rent an apartment from me. A visiting missionary talked about primitive pagan tribes who are dying without ever hearing of Christ -- "and so they go to Hell." That sort of mechanical legalism made me cringe. The missionary was obviously a good man, and I admired his zeal for souls... but not good theology. Jesus commands us to share the Good News with our neighbors to the ends of the earth, and we might suffer for failing to obey. But the pagans who die without hearing are not beyond hope! In the 1920's and 30's, Jesus appeared in frequent visions to St. Faustina, a Polish nun. There were miracles enough to confirm her stories. She was asked to keep a diary of her conversations with Christ. One time, Sr. Faustina asked Jesus what happens to those who die without knowing Him. Jesus answered her, "In that time, I am My own Apostle." We always hope that every person has the opportunity to know and accept Christ as Savior as part of his particular judgment. It is never too late to pray for a soul! It's more that we all have the chance to know Christ -- face to face -- before our final judgment is made. As for purgatory, a virtuous pagan (such as Socrates) would probably not need purification. Whereas a barely saved Christian (such as myself) might be in sore need of the mercy of Purgatory. I saw this when it happened. A mighty fine proud rose in my Catholic chest then and again now. The Bishop of Rome scooped up a boy in despair and was The Gospel to him.